The art of crafting a ship in a bottle was a favorite pastime of sailors in the late 18th and early 19th centuries, and it continues to this day as a hobby of landlubbers as well. It’s tedious, detailed work, but the end result is worth it, leaving people wondering just how the heck someone got the ship through the narrow neck of the bottle. It seems impossible. These days 3D printing enthusiasts, in describing to others how 3D printers can print the impossible, often say that a printer can even print the proverbial ship in a bottle. I’ve heard this quite often, but to be honest, I have never actually seen a miniature ship 3D printed in bottle. Not until today, that is, when I came across a recent post in Objet’s blog. It’s not exactly a traditional ship in a bottle. Instead of a hollow bottle, it’s a solid bottle of transparent Objet VeroClear material, which engulfs the ship, all 3D printed in one pass on an Objet Connex multi-material 3D printer. 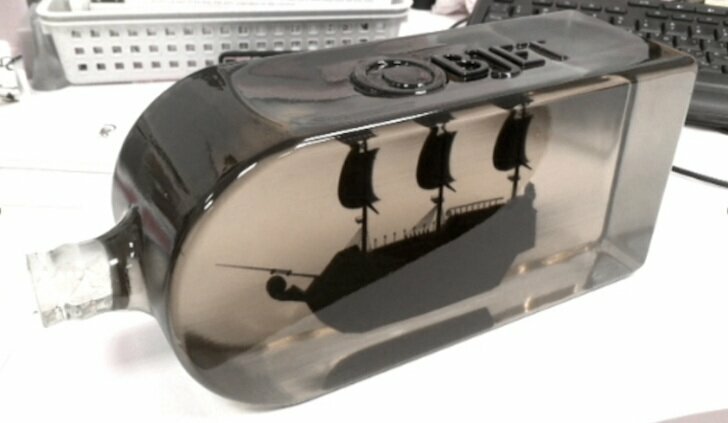 The ship itself is printed in Objet VeroBlackPlus™, a black, rubber-like materal. The two materials are often combined to create different artistic patterns. The 30 micron layer resolution enables the incredible detail you see in the extremely thin rigging between the deck and masts, the railings, flag poles and crow’s nests. Did I hear a challenge?